Entdecken Sie einige der schönsten Aussichten Roms bei einer Fahrradtour mit elektrischem Hilfsmittel. Mit einem sachkundigen Führer radeln Sie auf mehreren Hügeln Roms, darunter Aventin, Kapitol und Janiculum Palatine. Auf einem Elektrofahrrad erledigt der Motor die meiste Arbeit! Sehen Sie den Circus Maximus, fahren Sie durch Trastevere und genießen Sie die wunderschöne Aussicht vom Janiculum aus, bevor Sie zum Navona-Platz, zum Pantheon und zu zahlreichen anderen Sehenswürdigkeiten gelangen. Diese Kleingruppenreise ist auf 10 Personen begrenzt, um mehr persönliche Aufmerksamkeit zu bieten. Treten Sie in vier Stunden zu einer Menge zentraler Sehenswürdigkeiten und drei Hügeln Roms hinauf - ein seltenes Angebot. 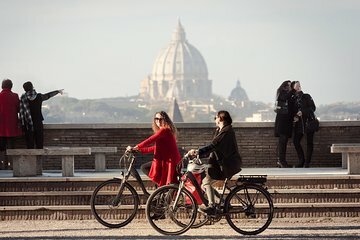 Ihre Radtour beginnt mit dem Treffen Ihres Führers an einem zentralen Ort in Rom zu einer Zeit, die zu Ihnen passt. Sie werden mit einem Elektrofahrrad gekoppelt, das wie ein gewöhnliches Fahrrad aussieht, aber die meiste Arbeit beim Treten in die berühmten Hügel von Rom überflüssig macht. (Wenn Sie die Übung jedoch bevorzugen, stehen auch reguläre Trekkingräder zur Verfügung.). Treten Sie von Roms starkem Verkehr ab und folgen Sie Ihrem Führer an Sehenswürdigkeiten wie dem Circus Maximus und dem Pantheon vorbei. Fahren Sie durch das farbenfrohe Viertel Trastevere und besuchen Sie beliebte Plätze wie die Piazza Navona und den Campo de 'Fiori. Steigen Sie auf den Janiculum-Hügel, um einen atemberaubenden Blick auf die Ewige Stadt zu erhalten, und fahren Sie hinunter zum Petersdom und zur Engelsburg. Beenden Sie die Tour, indem Sie auf den Kapitolinischen Hügel gehen und einen Blick auf die monumentalen Ruinen des römischen Forums werfen. We took a late afternoon tour around the city...it was just the two of us and the guide and it was wonderful. She was so educated on everything in the city...we learned so much and enjoyed the history lesson! Such a great way to see Rome. We have done the walking tours to see main sights this tour gave a new perspective and beautiful views of the city. And the bikes were definitely the way to go! This was a real highlight of our trip to Rome. We had great fun following our guide, Emanuel, and listening to his local insights. The size of the group was just right. We seemed to cover the whole city. Despite the warmth of August, the electric bikes made it effortless. We had an awesome tour. The electric bikes were fabulous it was so hot and they were of great assistance. We explored amazing ground using the bikes. Our tour started at 4pm which was perfect because we would be starting to enter the cooler part of the day. The back alleys and side streets were a thing we would never have explored. For this we are truly grateful we did the tour and would strongly recommend this to anyone who wants to explore the true Rome. I would highly recommend this as a way to see the majority of the main sites. Make sure to be well versed on how to ride an assist bike so that all of the shifting comes naturally as you travel on several busy roads. A bad rider in the group could cause major issues. Our guide was fantastic but we got behind schedule and had to rush the end. Amazing tour on e-bikes which was great as it was very hot that day! Imke was our guide and she was lovely, gave us so much information and tips which was great as we had only just arrived in Rome earlier that day. Will definitely book again. The best way to see Rome. The half-day tour was probably enough but an easy stroll around areas of the city you would not otherwise see was definitely worthwhile. We absolutely loved the panoramic tour with Bruno. It was the highlight of our trip in Rome and holiday in Italy. Such a great way to see the City and learn about its history. I am recommending this way of seeing the City to all our friends. The tour was the highlight of our trip to Rome, We went with Top Bike Rental and they were so friendly and professional . We popped in 2 days before the tour to check the details and the lady behind the desk was a gem. She gave us hints and tips to enhance our stay and by then we knew we had picked the right tour. Our tour guide was Valeria who was friendly and had so much knowledge throughout the tour she made our week. 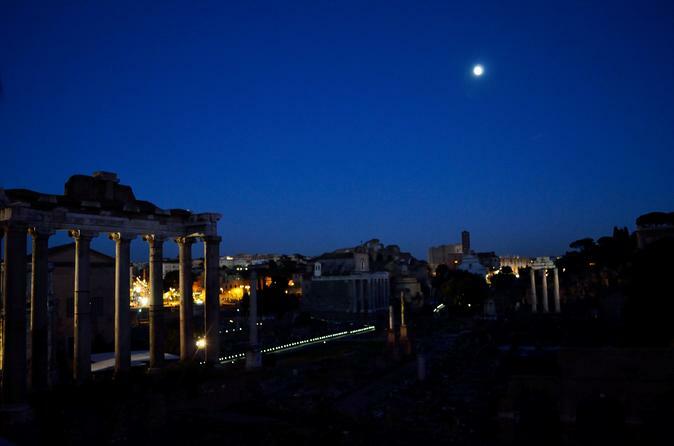 We felt safe at all times on route and believe this is a great way to see Rome.